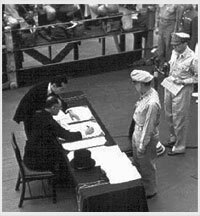 We hereby proclaim the unconditional surrender to the Allied Powers of the Japanese Imperial General Headquarters and of all Japanese armed forces and all armed forces under Japanese control wherever situated. We hereby command all civil, military and naval officials to obey and enforce all proclamations, orders and directives deemed by the Supreme Commander for the Allied Powers to be proper to effectuate this surrender and issued by him or under his authority and we direct all such officials to remain at their posts and to continue to perform their noncombatant duties unless specifically relieved by him or under his authority. Signed at TOKYO BAY, JAPAN at 0904. 1 on the SECOND day of SEPTEMBER, 1945. Accepted at TOKYO BAY, JAPAN, at 0908 I on the SECOND day of SEPTEMBER, 1945, for the United States, Republic of China, United Kingdom and the Union of Soviet Socialist Republics, and in the interests of the other United Nations at war with Japan.